If you need heating or air conditioning service in Clintonville, OH the company that you want on your side is Quality Air Heating and Air Conditioning. We treat all of our customers as our friend or family member because we are dedicated to all of our customers’ complete satisfaction. We offer a full range of heating and air conditioning service in Clintonville, OH including installation, repair, maintenance and replacement for many different types of systems. We understand that life is unpredictable, which is why we offer 24/7 emergency heating and air repair in Clintonville, OH. Call us anytime and you’ll always get a live person on the other end of the line. Winters can be pretty rough here in Ohio and every homeowner needs a great heater to keep them comfortable. If your heater isn’t performing well or if it’s time for a new system, call Quality Air Heating and Air Conditioning for all your heating system service in Clintonville, OH. We offer complete services including installation, repair, maintenance, and replacement for many different types and brands of heating systems. If you have a heat pump that isn’t working well or if your furnace is making any unusual noises, call us for 24/7 heating repair in Clintonville, OH. For new installation, we can help you pick out a new system and then our experts will install it quickly so that you can start enjoying the comforts of your home as soon as possible. When your heating system starts to break down, it can be tempting to reach for your tools and try to fix the problem on your own. While do-it-yourself projects are great, when it comes to your heating system, going out on your own could cause further damage or cause your heater to operate unsafely. Call Quality Air Heating and Air Conditioning for all your heating repair in Clintonville, OH. We know how to work on a large range of systems and we can fix any issue that you might experience. If you need a new heater in your home, you’ve likely noticed how many different kinds of heating systems are on the market. If you need help finding a new heater for your home call the Clintonville, OH heating installation experts at Quality Air Heating and Air Conditioning. We can talk with you about your home’s size, your energy usage goals and your budget to come up with a great option for your home. If your air conditioning system isn’t up to the task this summer, your home might be just as hot and sweaty as it is outside. Quality Air Heating and Air Conditioning is here with the high quality air conditioning service in Clintonville, OH that you need to stay nice and cool. Is your air conditioning making a funny noise or not producing enough cooling? We offer 24/7 air conditioning repair in Clintonville, OH. Do you need installation? We can help you find a great system and then install it so that you can get terrific cooling in your home. Call today! Your air conditioning system can break down at any time and you need a repair contractor that can help you at any moment. Quality Air Heating and Air Conditioning offers 24/7 air conditioning repair in Clintonville, OH for all types of systems. We are dedicated to responding quickly to your call and our technicians specialize in finding problems and fixing them fast. Whether you aren’t getting enough cooling or your AC has started to make a strange noise, call us for service. Installing a new air conditioning system is a big step for any homeowner. Finding your new AC can be difficult because there are so many brands of air conditioners on the market. Quality Air Heating and Air Conditioning offers comprehensive air conditioning installation in Clintonville, OH and we will help you through the entire process. Our technicians can help you pick out a new system that fits in your budget and will provide efficient and plentiful cooling. Call us today to talk with one of our friendly experts. Don’t forget to have your air conditioning system regularly inspected and tuned up. Doing so could reduce repair needs, increase efficiency and also extend the life of your system. Quality Air Heating and Air Conditioning offers terrific air conditioning maintenance in Clintonville, OH for all kinds of systems. Our maintenance program also includes reduced pricing for our members, extended warranties and much more. If you need to replace your air conditioning system, you don’t have to try to navigate the whole process on your own. Quality Air Heating and Air Conditioning is here to provide you with quality air conditioning replacement in Clintonville, OH. We will work with you to figure out a great alternative to your current AC system and then we’ll install it so that it will work efficiently and last for as long as possible. Call us today! If your customers, clients, or employees walk into your business and it isn’t comfortable, it can leave a bad impression on them. Quality Air Heating and Air Conditioning provides comprehensive commercial HVAC service in Clintonville, OH for all types of businesses. If your HVAC isn’t able to keep your business comfortable, we’re available 24/7 for emergency commercial HVAC repair in Clintonville, OH. If you need a new HVAC system for a new business or as a replacement to your current equipment, give us a call. We can install all types of commercial HVAC equipment and will get it done quickly. If your HVAC system starts to suffer, don’t let it also cause your business to suffer. 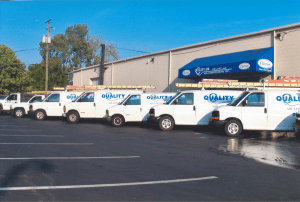 Call Quality Air Heating and Air Conditioning for commercial HVAC repair in Clintonville, OH. We often see some of our commercial customers who get so busy running their business that they wait to call for professional repair. This usually allows the issue time to grow and get larger. Call us at the first sign of trouble so that we can fix the problem before it grows larger. We’re available 24/7 for commercial HVAC repair because we know that your business needs to open every single day. Installing a new HVAC system in a business is no small task and you need the help of the professionals at Quality Air Heating and Air Conditioning. We have years of experience offering quality commercial HVAC installation in Clintonville, OH for many different kinds of businesses. Finding the proper size of HVAC system is critical to the efficiency and comfort inside your business. Let our technicians recommend a system for your business that fits in your budget and matches your business’ heating and cooling needs. Call us today to talk with one of our experts. Just like you need to get regular oil changes and tire rotations for your car, your HVAC system needs to be regularly tuned-up as well. Quality Air Heating and Air Conditioning offers commercial HVAC maintenance in Clintonville, OH which includes annual inspections and tune-ups from our experts, reduced pricing, extended warranties and much more. Getting your equipment maintained could reduce the need for repair, increase the efficiency of your system and also extend its operating life. Call us today for more information. Heat pumps do exactly what their name says: they pump heat from one place to another. They can also provide both heating and cooling to your home. In cooling mode, they absorb heat from your home’s air and exhaust it outside. In heating mode, they absorb ambient heat in the outdoor air and move it into your home. Quality Air Heating and Air Conditioning offers total heat pump service in Clintonville, OH for all makes and models of systems. We can repair any issue that you might have and we can also install a new heat pump in your home, so call us 24/7 for all your heat pump service in Clintonville, OH. Furnaces are a great option for many homeowners that want efficient and comfortable heat no matter what the temperature is outside. Quality Air Heating and Air Conditioning is proud to provide all your furnace service in Clintonville, OH. From installation and replacement to repair and maintenance, we have you covered. Our experts can work on electric, gas, and propane models of furnace so call us 24/7 for all your furnace service in Clintonville, OH.